My friend Ally has taken to saying this. It has become, in a way, her mantra. I’m not crazy, I’m wild. On sight, for me, Ally embodies the essence of a Wild Woman. Her sharp, cutting, icy, grayish blue eyes. Her long blonde hair that drapes over her like armour. Her smile, that when she paints it in the brightest and most daring reds, stops traffic. I love her strength. That survivor spirit. Her boldness makes me feel empowered. Ally and I moved from casual acquaintances to sisters when in the same week we both went through personal tragedy. We bonded as our feelings spilled out onto the floor and we attempted to pick them back up and make sense of them. We’d blast Britany Spears and dance for hours. If an audience was available we’d ask (*make*) them to watch us crush showtunes. In particular Rent’s Take me or Leave me. While very different women, with different backgrounds, views, and beliefs; we were women cut of the same “crazy woman” clothe. We care too much. We push too hard. We talk too loud. We are too passionate. We voice our opinions too freely. We are too clever. We dance too recklessly. We have comebacks ready too quickly. We love too fiercely. The elements that create who we are, that truly are the essence of our beings, were what have (and are) pointed to as making us crazy. I had resolved myself to this narrative. Boys and men have been calling me crazy since I was a child. I had been married to a man that convinced half the town that I was crazy. I had been told that having feelings made me crazy so many times, and I couldn’t figure out how to switch them off, that I believed I must be crazy. Because I care, I really care. It wasn’t until Ally looking over at me with her cool eyes responded to a joke I had made about us being crazy with, “nah. No. I’m not crazy, I’m wild.” that I started to look at this wording so many men have offered to me my whole life. I didn’t want it. I didn’t accept it anymore. See crazy to a certain level can be tamed. It can be controlled. Locked up. Medicated. Manipulated. Wild. Now wild, on the other hand, is unpredictable. Free. Not held back by the desires of others. Wild is scary and unknown. As women when we are told that we are crazy for being passionate, for caring, for loving; it’s used as a tool to control us and keep us in line. Being wild means nothing holds us back from loving fiercely, from caring wholeheartedly, from pursuing our passions. When I discuss with men my recent upheaval of my life, to pursue the unknown, to live a wild and free-range life, I am often met with one of two responses. What’s crazy about it? I lost everything this year, ranging from an eye to my reputation. The last three years, were the only time anyone had truly dared to tame me. The challenge was too enticing to one man and it nearly killed me. The men who tell me it’s crazy know that I can’t be controlled, so it becomes easier to dismiss me. I came alive again once I was set free. 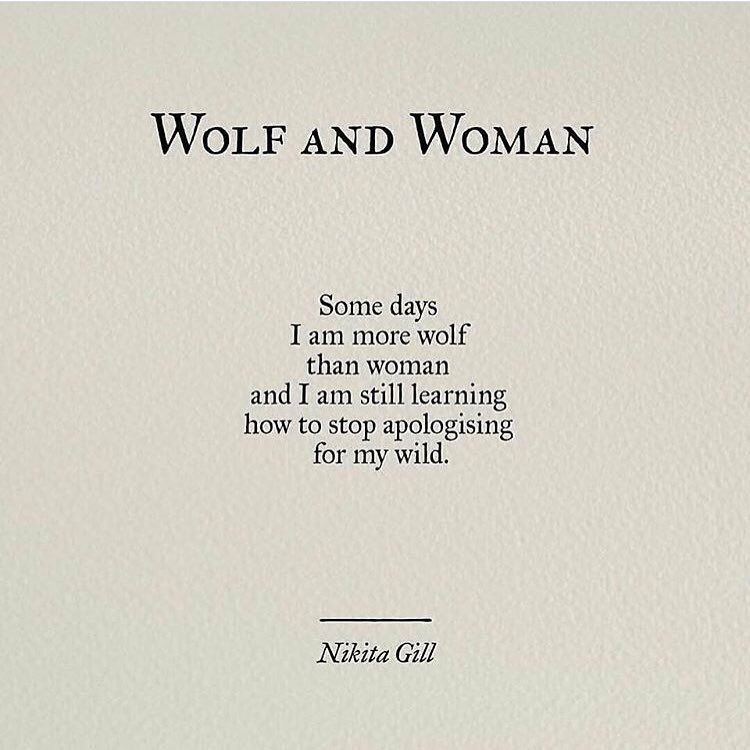 I have my pack, my sisterhood with other strong and wild women. They shelter me and hold me up when I’m injured and weak. Then they send me back on my path, but let me know I can return anytime I need. I can return as I am, no need to change. They allow me to stay wild, while being loved. When you are told that you’re crazy, change it to wild. When someone tries to control you with their words, remember words aren’t chaining you to anything. When someone tries to destroy you, remember your wild strength can over come anything. You aren’t crazy. You are WILD.